If you are heading to San Diego next week to look for ways to build and support your local math program, be sure to check out these thought-provoking presentations from these Stenhouse authors. The presentations listed below will be delivered by authors and educators who are known for their innovative ideas about bringing engagement and meaning to math instruction through their valuable tools and resources. Be sure to add them to your agenda! Tuesday, 4/2, 10:00 a.m. – 11:00 a.m. Pacific 25, “Bias toward Action: Designing Collaboration for Impact” This session will examine a case of like-minded educators overcoming barriers of time, resources, and isolation to form a community poised for action, and identify essential elements of meaningful collaboration and describe how to cultivate startup values within new and existing educator teams. Nancy Anderson, author of What’s Right About Wrong Answers? Tuesday, 4/2, 11:15 a.m. – 12:15 p.m. Pacific 17, “Avoiding Hidden Hazards on the Road to More Equitable Math Classes” This is session will address how common practices in mathematics education-including “do now” activities, homework, and grading practices-may inadvertently lead to greater inequities and describe the strategies we have used to identify and remove these hidden hazards. Wednesday, 4/3, 9:30 a.m. – 10:30 a.m. Pacific 18, “Turning Adversaries into Allies: Building Community-Wide Support for Your Initiatives in Mathematics Education” This session will provide educators and administrators with strategies and resources to help them build momentum in their communities to support meaningful and powerful mathematics education for all students. Wednesday, 4/3, 10:45 a.m. – 11:45 a.m. Pacific 22, “How Will We Know What They’re Thinking? Sparking Teachers’ Curiosity About Students’ Mathematical Ideas” There are four channels via which we can gather information about student thinking: looking at student work, observing students while they work, conferring with students about their thinking, and asking students to reflect on their learning. Together, we’ll explore how teaching teachers to open these channels sparks a productive chain reaction. Wednesday, 4/3, 1:45 p.m. – 2:45 p.m. Pacific 22, “Using Learning Labs to Support Teachers in Mathematizing Children’s Literature” This session will explore how to leverage Learning Labs, a professional learning community model, to support teachers in using literature to engage students in discussions that foster mathematical wonder and joy and encourage students to notice mathematics in their own world. Wednesday, 4/3, 3:00 p.m. – 4:00 p.m. Pacific 19, “Learning in Practice: A Coach Routine to Support Teachers as They Teach” This session will examine a coaching routine called the Teacher Time Out that helps open up opportunities for teachers and coaches to discuss teaching while they are teaching students. We examine video and discuss how this routine can support teachers’ learning. Monday, 4/1, 1:30 p.m. – 2:30 p.m. Torrey Pines 2, “Designing Teacher Study Groups to Transform School Culture” This session will examine video case studies to analyze how teachers became the leaders of their own learning in developing the goals and action plan for studying their practice, which ultimately enhances the student learning in the classroom. Monday, 4/1, 1:30 p.m. – 2:30 p.m. Pacific 26, “Collaborative Coaching: How Do We Learn Together as a Team?” Collaborative coaching tools that have been successful in K-8 schools, such as student interviews and mini-lesson studies, will be shared and discussed. The role of administrators, coaches, and teacher leaders in these teams will also be analyzed and explored. Tuesday, 4/2, 11:15 a.m. – 12:15 p.m. Santa Fe 1, “We are all works-in-progress: Using Rough Draft Thinking for Students to Revise Mathematical Thinking and for Teachers to Revise Instruction” This session will explore various routines for revising mathematical thinking, from lesson structures to protocols for peer-to-peer discussion, and discuss various goals for revising, going beyond correcting mistakes to include creating more precise or illuminating explanations. Wednesday, 4/3, 3:00 p.m. – 4:00 p.m. Pacific 21, “Mathematical Modeling Can Make You Filthy Rich” Mathematical modeling is the closest we can come to giving our students HUGE potential to make them filthy rich. So much of what we teach is instantly irrelevant because of devices we carry in our pockets. I’ll share an intuitive structure that will help you develop a common language with your teachers to separate fake mathematical modeling from what will really help students become complex problem solvers. Enjoy NCSM 2019 San Diego, everyone! The Massachusetts Reading Association (MRA) 50th Annual Conference is coming up soon. Check out the scheduled presentations from these inspiring Stenhouse authors and give your professional learning a boost! Thursday, 4/4, 10:00 a.m. – 11:15 a.m., “The Writing Thief: Where Literature Lives in the Writing Classroom” It’s been said that good writers borrow while great writers steal. Writing thieves read widely, dive deeply into texts, and steal bits and pieces from great texts as models for their own writing. Using the Traits of Writing as a guide, explore new books so student writers thrive. Thursday, 4/4, 3:00 m. – 4:15, KEYNOTE “What’s in Your Writing Wallet? Yes You Can Teach Writing Well Without Worksheets” Explore new ways to teach writers without worksheets – ways that really work. Learn how to create and manage a Writing Wallet that you can use right away as you help students understand writing process – especially revision and editing. Gravity Goldberg, new Stenhouse resource coming soon! Thursday, 4/4, 1:00 p.m. – 2:30 p.m., “Teach Like Yourself: Why Your Students Need You to Be You” What your students need most is for you to show up fully as yourself in the classroom. When you are your most authentic teacher self you give permission for your students to be the same and the real work of learning can happen. Friday, 4/5, 10:00 a.m. – 11:15 a.m., “Patterns of Power: Inviting Young Writers into the Conventions of Language” Meaning is made when reading and writing crash together in the conventions of language. Where do concept formation and mentor texts fit in? Come discover brain-based, practical ways to use the reading and writing connection to teach grammar and editing in a way that enhances composition and comprehension. Friday, 4/5, 11:50 a.m. – 12:50 a.m., “Inspiring Learners: Embedding Social and Emotional Skills in Literacy Workshops” Social and emotional learning is at the heart of good teaching, but as standards and testing requirements consume classroom time and divert teachers’ focus; these critical skills often get sidelined. This session will show how to teach social and emotional skills with engaging and integrated literacy lessons. Friday, 4/5, 1:15 p.m. – 2:30 p.m., “Everyone is a Teacher in a Writing Community” Diane and Lynne discuss their rationale for foregrounding formative assessment in classrooms, addressing how we help students build their writing identity, and how we use that knowledge to inform instruction. The facilitators explore peer, small, and whole group conferences with video clips, giving close-ups of writing workshop in action. Cris Tovani, author of Do I Really Have to Teach Reading? 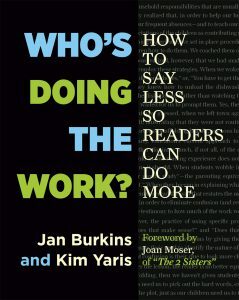 Friday, 4/5, 2:45 p.m. – 4:00 p.m., CLOSING KEYNOTE “Let’s Switch Questioning Around-Reigniting Readers’ Sense of Wonder” Teachers get weary of always being the ones responsible for asking the questions. Research is clear. Whoever is asking the question is the one who is learning. When the experts get to ask all the questions, students’ thinking shuts down. During this keynote, Cris will ask teachers to consider questioning in a different light. She will encourage participants to examine how questions drives their comprehension and consider how they can use what they discover to reignite their students’ curiosity about required curricula and content.